Quiet and economical supply of pressurised water to multiple points of use within a building. Ideal in domestic and light commercial uses where the enclosed design and low noise and vibration are desirable. A variable speed inverter runs the pump only as fast as necessary to maintain the desired pressure, achieving high efficiency, minimising noise and vibration and reducing running costs. The pump motor is protected by the inverter against failure caused by overload/stall conditions and dry running. A slow start and stop of the pump eliminates sudden pipe vibration and water hammer. WRAS approved water storage tank. 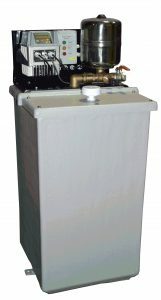 Available in three sizes, 230L, 570L and 1000L. In the Original Model, the tanks are quickly filled by a large 1″ solenoid valve and the water level in the tank is controlled by safe and reliable 24v low voltage sensors. A display panel clearly shows when the system is powered, filling the tank, or in a fault condition. Overflow warning and protection is provided by a high level sensor which displays a fault and halts the solenoid valve, providing an additional failsafe mechanism in the event of a failure or jam of a lower sensor. Whereas the Basic model is quickly filled by a high speed float valve. An articulated ball arm provides additional movement reducing unnecesary valve activity. Both models are designed, and assembled in the UK. With full UK based technical support, rapid spares availability, and spare parts supply from UK stocks. Full recon/repair service available to component level.